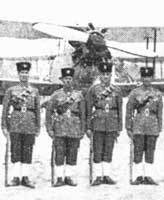 When the Royal Flying Corps changed to the Royal Air Force, on 1st April, 1918, its Scales of Equipment meant that its accoutrements were pure “Army”, namely Pattern 1908 W.E.. In time, in establishing their new identity, they adopted the very latest in webbing, Pattern 1925 (q.v.). Both drab Patt. ’08 and blue-grey Patt. ’25 were then listed in their Stores Catalogue. After the Great War ended, both the Army and Navy made attempts to recover the lost elements of their Air Arms, but the new Chief of the Air Staff, Sir Hugh Trenchard, together with such as Winston Churchill and T.E. Lawrence (better known as Lawrence of Arabia) were instrumental in thwarting these attempts, as part of the outcome of the Cairo Conference on Iraq, in 1921. As part of the settlements of the Armistice, Great Britain found itself with Mandates in both Palestine and the Trans-Jordan. The cost of maintaining garrisons of Army troops was considerable, but Trenchard proposed something rather more radical. The R.A.F. could police – as the term was – these territories, with no requirement for the Army to be involved. Such a cost-saving certainly pleased the bean-counters and ensured the continued existence of an independent R.A.F..
A local force, the Muntafiq Horse had been the nucleus of what was later enlarged into the Iraq Levies, under Colonial Office control, but with seconded British Army officers. In October 1922, the R.A.F. took over from the Army, with the Air Ministry now responsible to the Colonial Office. In 1928, the Levies passed totally into R.A.F. control, giving them a small Army of infantry, cavalry, artillery and armoured support from the R.A.F. Armoured Car Squadrons. In the same year, the Aden Protectorate Levies (A.P.L.) were also formed. Air power was added to the mix - used generally in a most unusual manner. The devil finds work for idle hands, so troublesome factions in villages were dealt with by bombing the village. Of course, before this happened, there would be a leaflet drop, warning the villagers to evacuate. This done, the village would be bombed, the R.A.F. would leave and the villagers would return to re-build the village. By these simple means, idle hands were kept busy – too busy, in theory, to cause trouble – at least until the next time! In consequence of these, some rather older Army Patterns of accoutrements had to be added to the R.A.F.’s Vocabulary of Stores, representing those worn by the Iraq Levies and their counterparts in Aden. These were from Patt. ’03 Bandolier Equipment and comprised Belt, waist; Bandoliers of both 50 and 90 round types; Carriers, water bottle; Frogs, bayonet, brown leather, together with Sam Browne Equipment for the officers. Cartridge pockets were not worn on the Belt. These items were still listed in January 1942, but the actions of the Iraq Levies, during the Siege of R.A.F. Habbaniyah, in 1941, had earned them the title of R.A.F. Levies, together with the privilege of wearing the R.A.F.’s shoulder eagle badge. Uniforms and accoutrements then changed to khaki Battle Dress and drab Patt. ’37 W.E.. The A.P.L. sergeant, with the sash of his rank, shown left is wearing the 90 round Bandolier backwards, the brass triangle on his left shoulder, instead of under his right arm. A 10 round B.E. Cartridge Pocket has then been added. In 1942, the R.A.F. therefore had on charge seven patterns of accoutrements: Patt. ’03 B.E., drab Patt. ’08 W.E., blue-grey Patt. ’25 W.E., blue-grey Patt. ’37 W.E. ; drab Patt. ’37 W.E. and, for the officers, the blue-grey Web Equipment for Officers (introduced in 1925) and Sam Browne Equipment.